Shirley Ng-Benitez loves to draw! Fond memories of her youth, nature, and her two daughters inspire her mixed media illustrations. Since '98, she's owned Gabby & Company, her design, illustration, and lettering firm, and is now living her dream illustrating and writing picture books in San Martin, CA, with her husband, daughters, and pup. Shirley's very honored to have illustrated this book, her third published by Magination Press. You can find more of her work on her website, Shirley Ng-Benitez Illustration. 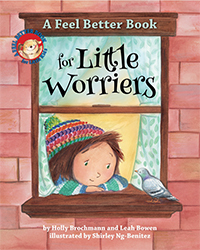 A Feel Better Book for Little Worriers is a gentle rhyming picture book for children ages 3 to 6 who may be developing anxious feelings but are too young to comprehend the implications. It is easy to use, appealing, and effective for parents to use with their little ones, and includes calming tools based on science-based strategies such as cognitive behavioral therapy and mindfulness principles. The “Note to Caregivers” gives information about recognizing and distinguishing worries and managing anxiety.